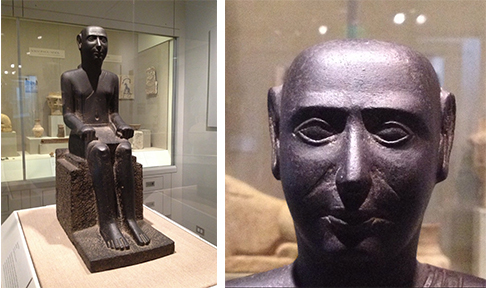 When it comes to the Kelsey Museum of Archaeology’s collections, not all artifacts are created equal. Some call out to us intellectually, others emotionally. To that end, we asked our curators to name their favorite Kelsey artifact or object. Stone stamp seal (upper left), modern impression made by the seal (upper right), with drawing of the seal below. 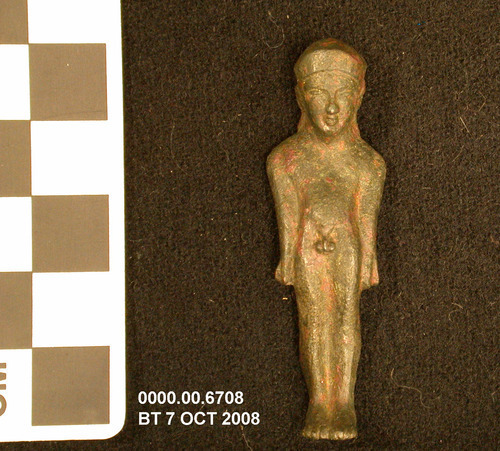 Favorite Artifact: Female with grain and symbols. Stone stamp seal. Late prehistoric period (4500–3800 BC). Tepe Giyan, Iran. KM 1991.3.74. Why: First — this object is one of a large group collected at the site of Tepe Giyan by Ernst Herzfeld, a very famous and important archaeologist. Second — the imagery carved on the seal is really important in the history of visual art. About Artifact: Images of power, cult, and cosmos were disseminated on large monuments and also on small portable objects such as cylinder and stamp seals. Seals bore scenes carved in the negative onto cylindrical or flat surfaces and then rolled or pressed into still-damp clay documents and tablets to yield infinitely reproducible possible renderings. This stone stamp seal is one of the earliest examples of a particular and very resonant image of female fecundity in ancient Near Eastern art: an iconic motif of the female figure with limbs splayed to suggest sexual invitation, birthing, or both. She is flanked by sheaves of grain, symbols of abundance through the ages, representing the fertility of flocks, human families, and the earth itself, an image that reverberated throughout later seal traditions in the region for the next 3,500 years. When viewing the seal, keep in mind that ancient seal carvers worked at a very small scale and had to create forms in the negative. Background: Gods, rulers, regular mortals, and institutions all had seals. Seals carried status as emblems of personal identity and administrative authority, and they were used as signatures on contracts and/or official tablets. They also had magical properties to bring good luck or ward off evil. Often seals were passed down as heirlooms. By the same token, the special properties attached to seals meant that they were often buried with their owners or strewn as votive offerings in the brick work of important buildings. Find It: In the ancient Near Eastern seal exhibit case on the first floor of the William E. Upjohn Exhibit Wing of the Kelsey Museum. Enter the museum through the Maynard Street entrance, go straight by the Security Desk, and then turn right and right. The ancient Near Eastern seal exhibit case will be directly in front of you. Learn More: The stamp seal described above is featured in Root’s 2005 book, This Fertile Land, available for purchase in our gift shop or online. Attic lekythos with funeral scene. KM 2604. Favorite Artifact: Attic lekythos with funeral scene. Clay, white ground. Greece. KM 2604. Why. I have been captivated by Greek vases ever since I was 10 or 11 years old — perhaps (although I certainly didn’t know it at the time) for the same reason that inspired Keats to write the “Ode on a Grecian Urn”: because, as the “foster child[ren] of silence and slow time,” Greek vases conjure up such vivid sensations of an ideal past. 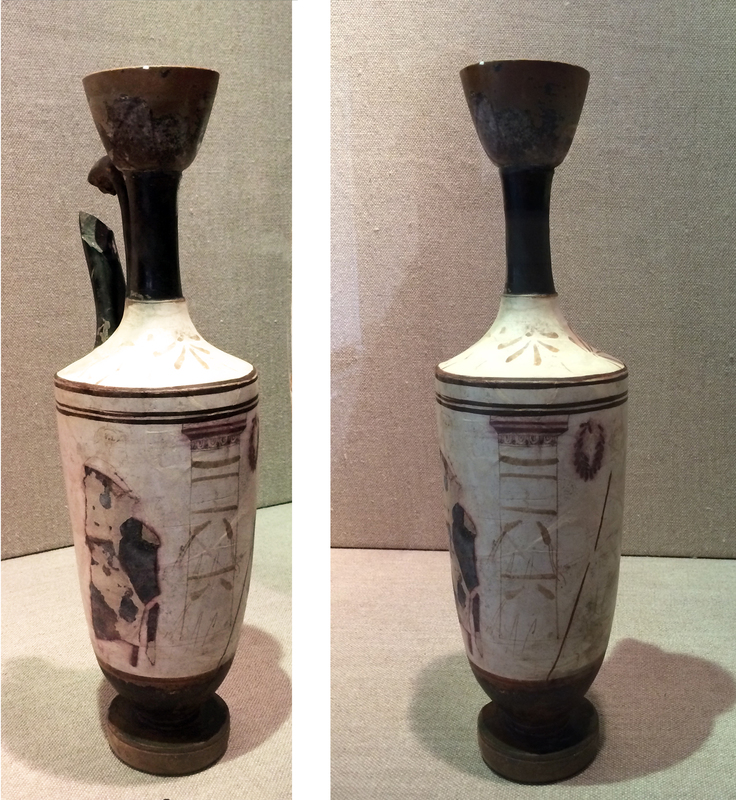 My favorite vase in the Kelsey is a 5th-century BC oil jar known as a lekythos, made as a grave offering. Vases of this type are often decorated with scenes of men and women leaving gifts in front of tombs, and in this way they are interestingly self-referential. But what I like most about them is their draftsmanship. This vase shows two men standing on either side of a gravestone. Both the men and the monument they flank are drawn in outline on a white background, with details such as the men’s cloaks filled in with colored paint. In many ways this is a humble object — it was produced quickly for retail sale — but that is partly what makes it so appealing. Its simple line work seems perfectly in tune both with the function of the vase and with the solemnity of the scene it depicts. Background. White-ground lekythoi, like this one, were usually associated with funerary rituals. Produced primarily in Attica during the 5th century BC, they were placed both inside and outside graves and filled with oil as an offering to the deceased or to the gods of the underworld. The coating of white slip and delicate drawings are often fugitive, since much of the color was added after firing. This vase shows a typical image of a tomb encircled with ribbons. One of the figures may represent the departed, the other a visitor to the grave. Find It. 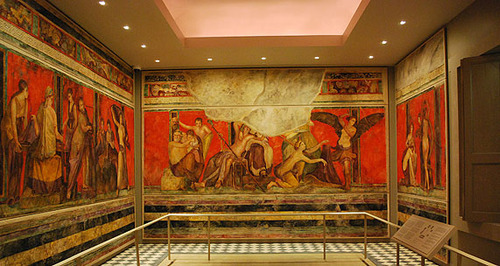 Locate the ancient Greece exhibit case, which faces the wall of windows on the first floor of the Kelsey Museum of Archaeology’s William E. Upjohn Exhibit Wing. Facing the exhibit case, turn right and walk to the end of the case, then turn left and left. You’ll be facing the end case, which holds two lekythoi, including Director Ratté’s favorite. Learn More: Archaeology and the Cities of Asia Minor in Late Antiquity, edited by Ortwin Daly and Christopher Ratté, is available for purchase in our gift shop or online from our distributor. 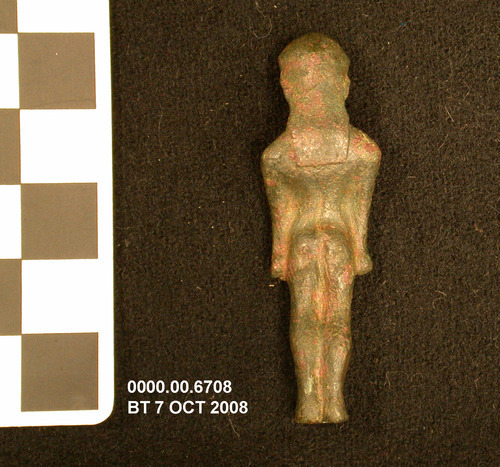 When it comes to the Kelsey Museum of Archaeology’s collections, not all artifacts are created equal. Some call out to us intellectually, others emotionally. To that end, we asked our curators to name their favorite Kelsey artifact or object. Here is the sixth in a series. Amphora by the Berlin Painter. Why. The amphora’s aesthetics as well as its subject matter. The simple beauty, wonderful color, rich black background, and elegantly drawn people move me. I love the way the painter has given us two individuals focused only on each other. It’s a poignant moment frozen in time of a warrior going off to battle or returning from war. Although the topic’s roots go back to antiquity, we can still relate to the difficult issues of war in our time. While it is hard to see, there is also a shield behind the warrior that was incised by the artist but never painted. It makes me wonder why the artist never finished it. About Artifact. The painter of this amphora, who like many other Athenian vase painters never signed his name, can be recognized by his style on more than 300 vessels, some of which are among the most beautiful surviving examples of red-figure pottery. He is called the “Berlin Painter” after his masterpiece now in Berlin (Antikensammlung). His simple, elegant composition often “spotlights” one or two figures against the dark background. The scene on this side is most likely one of sacrifice, with the young warrior setting off to or returning from battle. Facing the youth is a woman who may be his wife. The warrior holds a spear; an incised, but never painted, shield is faintly visible behind and to the left of him. The reverse depicts an old man with a staff, perhaps the warrior’s father. The young man also holds a vessel, which, however, seems to be the wrong kind for a libation or sacrifice scene. Background. In scenes of this nature, figures are more often painted holding a non-footed vessel called a phiale. The piece may have been incorrectly restored before it arrived at the Kelsey. The Kelsey Museum purchased the Berlin Painter amphora through Bruce McAlpine of Bruce and Ingrid McAlpine Ancient Art, London dealers. It was part of the ex-collection of Lord Belper of Nottingham, England. Find It. First, locate the ancient Greece exhibit case on the first floor of the William E. Upjohn Exhibit Wing of the Kelsey Museum of Archaeology. This exhibit case faces the wall of windows. While standing in front, look toward the right-hand end of the exhibit case where the artifact sits. Two Talalay books — In the Field: Archaeological Expeditions by the Kelsey Museum, coauthored by Lauren E. Talalay, and Prehistorians Round the Pond, coedited by Lauren E. Talalay — are available in our gift shop.